Hello hello! Welcome to my turn to the spell it with fabric blog hop! I'm Very excited to have you! I'm your host Vanessa Christenson of V and Co. This post is brought to you by the letter V ;) naturally. Of course V is an awesome letter for me to have for all obVious reasons. 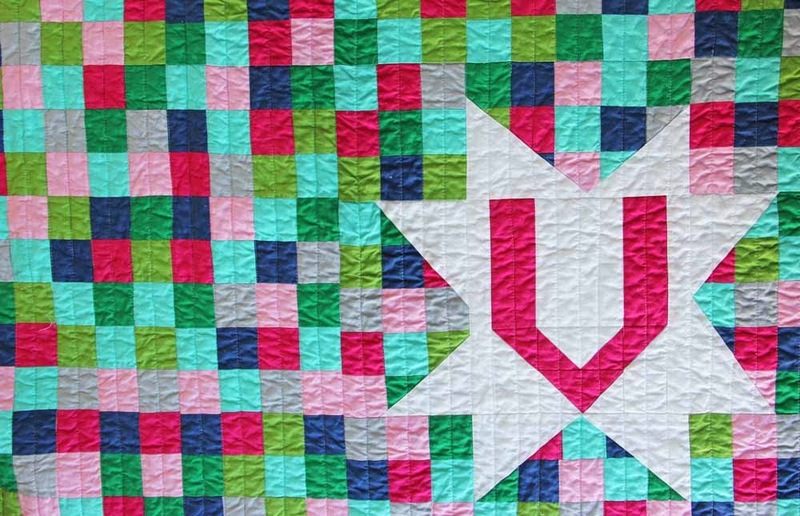 I made my "Supa-Star V quilt" to show off my "V" block at last fall market. It's based off of my Lucky Star quilt pattern somehow making it personalized with a big letter V has got it perks, as no one dares to use my quilt so it's always readily available for me when I need it...and this winter, oh man haVe I needed it. Safe to say I use it eVery day. So aside from having the perfect letter block assigned to me for obVious reasons...I get to answer a few fun questions using the letter V as well...totally sounds fun right? Oh yeah? Sounds fun till you actually have to do it. I mean HELLO, how many times do you use a descriptiVe word starting with a letter V? NOT OFTEN. But we'll give it a go. 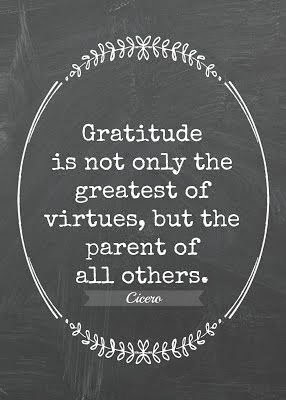 And I truly am grateful for so many things. My family being of course my biggest blessing I'm grateful for, but also just every day that I get to wake up, healthy, happy, and alive. Honestly, everyday I give thanks for what I call my life. Ahem speaking of blessings one of them also known as my third noisemaker is having a birthday today. He is obsessed with turtles so of course a little turtle cake was in order. We're celebrating all things him today and I'll get to his own blog post in a couple of days. :) after the blog hop festivities die down. So do you want to feel like a Vwinner too? from now till Saturday the whole V and Co store is 25% off when you enter MODASPELL when you check out. (ALL Thread is now BACK ORDERED (that sold out quick!) but I'll grant the sale price if you don't mind a little bit of a wait)...if you order something else it will ship with your thread when it comes in. All you have to do to enter is leave me a comment telling me what you would do with your prize if you win. (and yes petting it or staring at it is a very good answer too) please include an email address in your comment if your profile does not have an email attached to it. Friday is the last day to enter then we will announce the winner. Well I'd probably add it to my stash and stare at it until inspiration hits me! Love the colors ... Hmm What would I do with it! Look at it, look through patterns, look at it some more and smile. Pretty, pretty fabric ... where do you want to go? I know! In a special quilt for a best friend! Happy, happy fabric!! (Okay, it's late and time for bed, obviously!) Great giveaway and V was the first letter of my last name!! I'd make a quilt for my bed after I hoarded it for a few months. 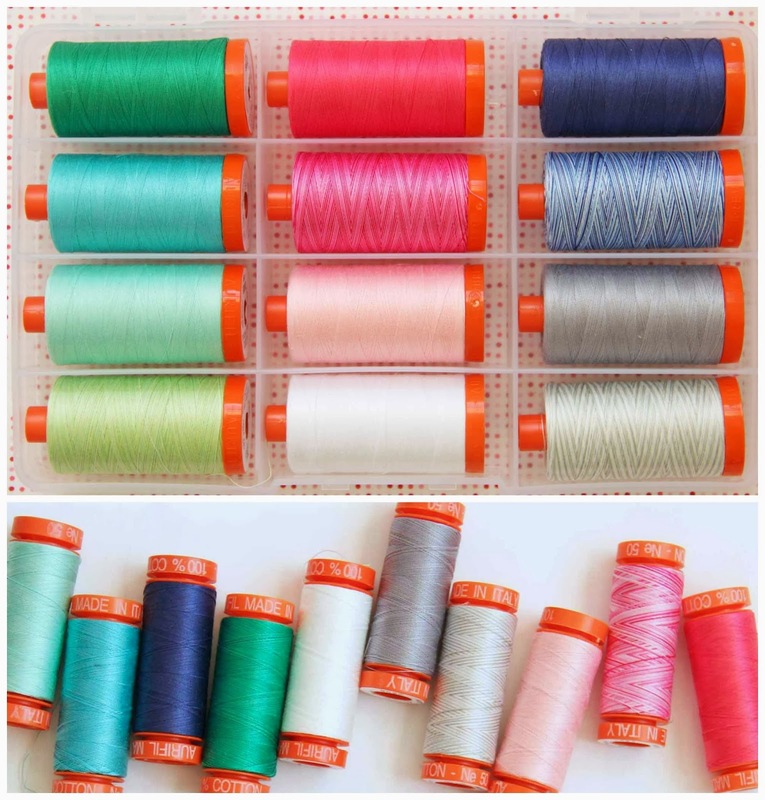 I would love to say that I'd sew up something beautiful right away, but honestly, it would probably be eye candy for a while ;) thanks for the giveaway! After having introduced myself to the fabric, and taken the time to become familiar with it all, I would then arrange a meeting between it and other fabrics that in my house. I would then hold auditions for the pieces to see which other fabrics they would work well with, and have them suggest a suitable pattern to show off their best features. Sounds like a good plan to me, now all I need is a chance to win! I would admire the fabric for a while until a project ( quilt or bag)hit me n the head, then and only then would I use at beautiful fabric. Thanks for the"V" and the idea way. Super Exciting! I would make so many things -little baby gifts, zipper pouches, and hopefully have enough left for a quilt! I would pet it, love it and name it 'George'...actually it would be stored in my antique trunk with other quilting fabrics and then when I retire - hopefully at the end of this year - it will come out and play with me in a pretty quilt. Thanks for the opportunity! First I Love your quilt and patterns. I think I would just unroll the jelly roll and stare at it awhile, feel the fabric and then make a quilt. Fabric must feel good to make a wonderful quilt. I used to but this Egyptian Cotton that I loved to quilt with. I can't seem to find it anymore but it sure was wonderful. My grandson loves Dinos so I have sewed so many Dinos I know the feeling! I would make a very Vibrant quilt! Love all of your designs and patterns....and love your humor! Aloha from Hawaii......the sun is waiting for you here, best place to Vacation.....and maybe teach a class or two! I love what you shared with us in this blog. I would use the material to make care quilts for our oncology patients at our hospital and cancer clinic. I love colors, and they very much do bring me happiness.Your gift offerings are very generous. And lastly, I think your little diatribe on the letter V was very creative as our your lovely designs...so the obvious, I think you should claim yourself victorious! I would touch it, stare at it, display it to enjoy it more and then I would make the most darling quilt!!! I'd definitely use some for my godfather's quilt, and leave the rest for the next just right project (and yes, stare at it in the meantime). This is great!I love the colors!I made cover for my girls, or beautiful, colorful summer bag. After all the petting, cuddling and oohing and aahing that is obligatory with such beautiful fabric I would make a baby quilt, we have a glut of babies due in the next couple of months. I would touch it and stare at it and then do both again. I love how you put your letter in a star. This fabric is just yummy. After much stroking it would probably be made into a picnic quilt. Thank you for the giveaway. I'd fondle and pet it then make a quilt from it. Well I would be very happy to give it a good home and stroking and patting would of course be involved! All that fabric!?!?!?! Wow, would definitely be stroking and looking through it to see all the pretty designs. With so much fabric it would have to be a quilt.... then would have to see how much I had left. I'm drooling just seeing the fabric on your blog so I'm certain that is the first thing I'd do with it if it were in my possession. I definitely would be making a quilt out of it! Wishing your son a Happy Birthday. 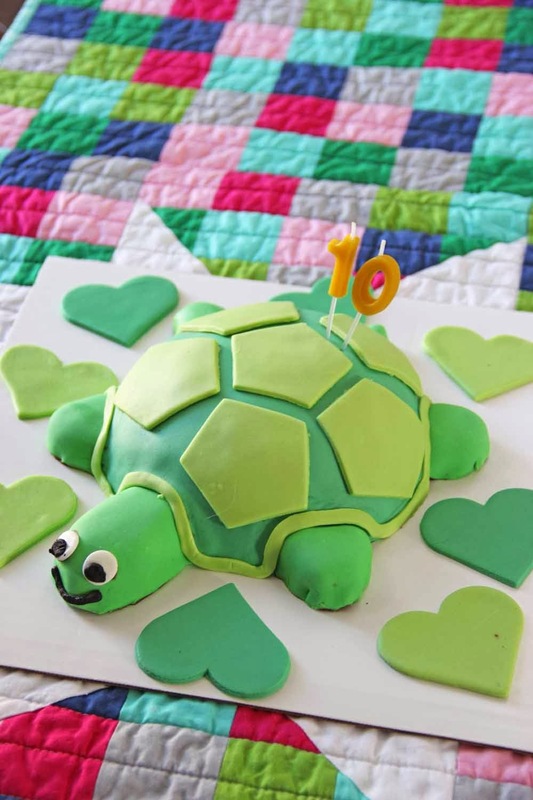 Love the turtle cake! My sister has always loved turtles... gives me an idea for her next birthday! I would use my winnings (I hope!) to make a quilt. Thanks for the chance to win! The fabric would have to sit a while and speak to me. Jelly rolls make fabulous display pieces in my sewing room. This would be the fabric that you just hate to use because then it would be all gone! Thanks for hosting! I have had my eye on your new line...after staring at it, I would love to make a lucky stars quilt. I seem to be making stars a lot right now, so it fits right in! Happy pillows and zippy pouches. Love your work! If I was given the fabric I would jump for joy and as I've been eyeing up your lucky star pattern I'd make that quilt for snuggling and gazing at! My youngest noisemaker needs some bunting in her bedroom with her name on it so she doesn't get jelous of her sister's when she learns to read ;-). I would be Very happy to make a quilt with this fabric. Thanks for the giveaway! Hmm, stroking it and admiring it are two of my most favourite things to do with beautiful fabric. I love your fabric ranges and I would love to make a quilt for myself. The colours are so pretty and would look beautiful in my lounge room. I would show it off to everybody and then sit and admire it! Petting fabric, I thought only I did that! Well first I would have to let the fabric tell me what it wanted to be, but most likely a quilt and a bag would be the results. your that I won! Thanks for the giveaway! I am obsessed with the colours in your Colour Me Happy range - plus I love the name. 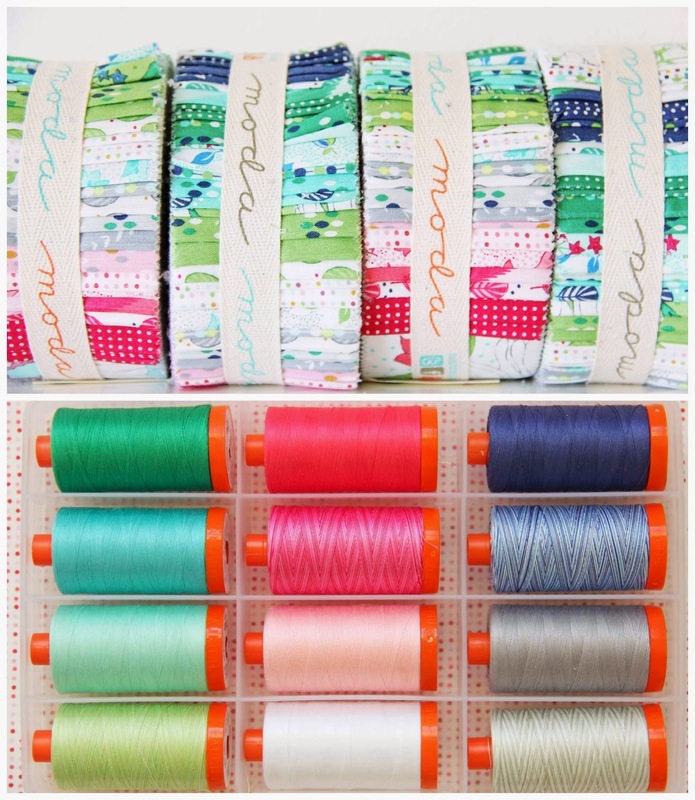 As to what to do….. yes, sometimes it can be tough to open one of Moda's delicious pre-cuts that look so pretty on my shelf next to a few (OK many) others. I love the look of your Flower Box pattern so maybe I could be strong, if I won your fabric, and manage to undo that Jelly Roll ribbon. LOVE your fabrics. I've just used a jelly roll of Simply Style for a couple of baby quilts. Such lovely lovely colors. So would probably get stuck right into another quilt with these gorgeous fabrics too! I would love to keep the prizes all displayed on my shelf, but they would be perfect for making my niece a quilt. Since her name is Vivian, it would be double-y perfect and the V quilt you made for your letter would be Very nice to make her. I used to think I quilted with my fabric but now I think I use it more for decoration....even though I sew every day!! Hmmmm.... Some is just so pretty!! I am making lots of lap quilts to give as Christmas gifts, so I would love to use one of these prizes for that! Thanks for the chance to win. Of course I would make the Lucky Star quilt! It's been on my want to make list for awhile. I would make the quilt pattern that's part of the giveaway - it is beautiful! I have been waiting for your new line to come out! Would love to use it for this alphabet quilt. Jump for joy, pet it, then leave it on my sewing table as incentive while I finishe up some UFO's. Thanks to this blog hop I am discovering your blog universe. So much fun here! Vive V & Co ! Wow, I would be Very Happy to win your giveaway. I'm loving the colors and would use them in your Lucky Star pattern. Thanks for the opportunity to win. Such pretty colors in your new fabric line! It would look good in my sewing room :) Thanks for the chance to win! 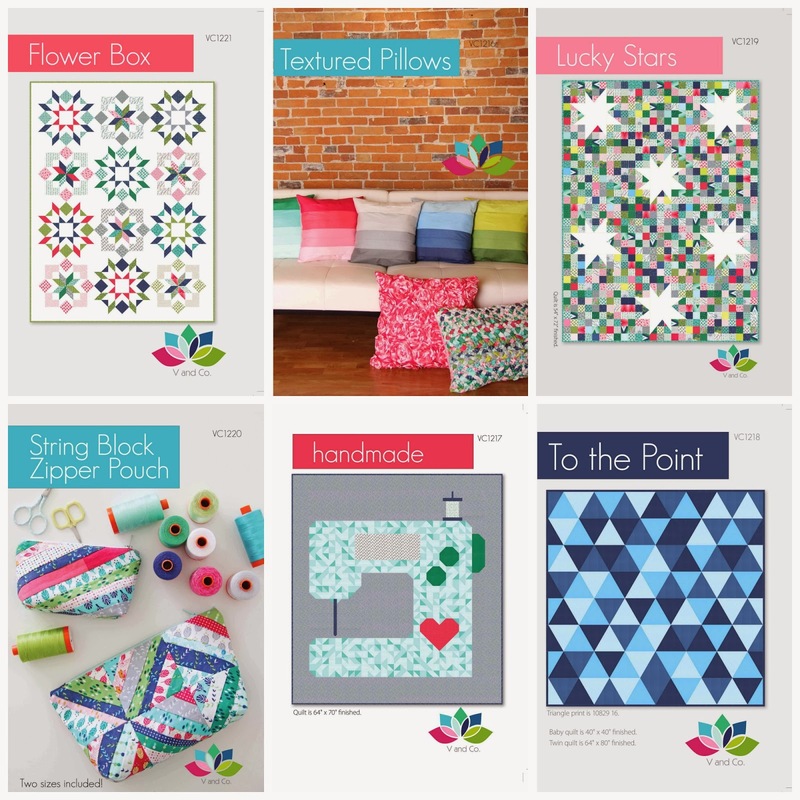 I love your Lucky Star quilt pattern and the Happy fabric line. The colors are a perfect celebration for the end of a long winter! I would sew sew sew!! Lol. 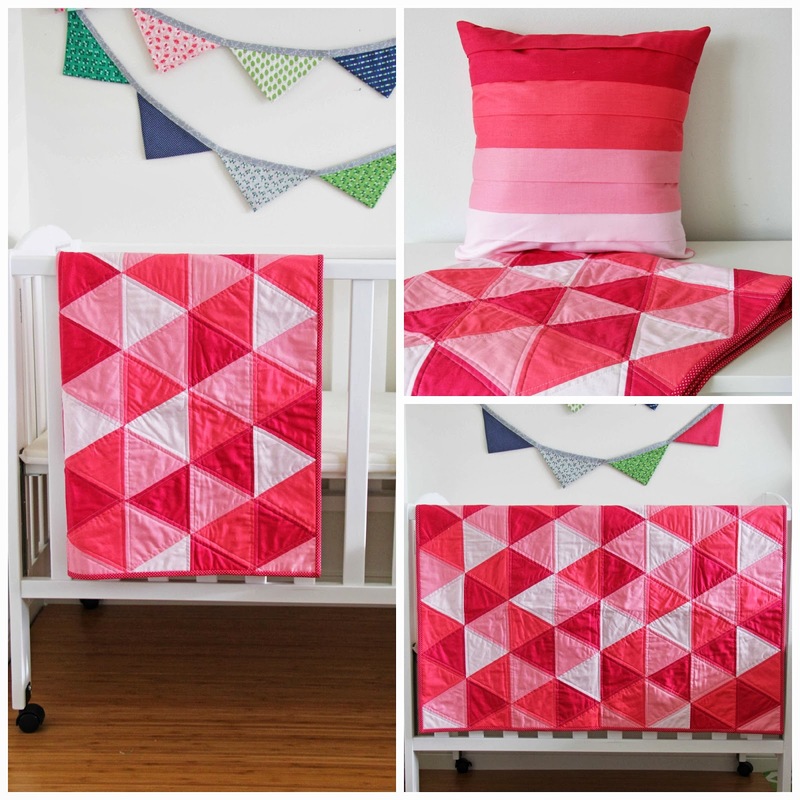 I like no..love the Supa-Star quilt for the Color me happy line! You did a great job using those V words!! LOL, great looking quilt too. I, for sure would pet some won fabric for awhile, listen to it, and then make whatever it decrees it needs to be :) Thanks for a fun hop! Love your site! I'm glad that storing and looking at fabric on a shelf is a good answer because that is exactly what I'd do! Thanks for the chance. I have 6 grankids that I can make quilts for so I would use it to make a quilt for one of them.Thanks for a chance to win. I love that star quilt and have never made one... if I win, this would be my plan!! Thanks for the chance! ps I like Vacations too!! I'd probably keep the jelly roll together and so pretty as long as I could stand it while looking at hundreds of quilt patterns to decide what to do with it! I am inspired to use your fabric to make a Moda alphabet quilt. I think I would make a summer quilt for my back porch. Your fabric is so beautiful! If I were to win, I would make a quilt to donate to ALS - and what a perfect name to cheer up a patient - "Color Me Happy!". Thanks for the opportunity and enjoy your celebration! I would make the lucky stars quilt, love that scrappy look! I would make a lovely quilt and some pillows! I have a new grand baby due in August that I need to make a quilt for, perfect to use your fabric for! Whaf a great give-away. I love your quilt and I will try to make one (not as good as yours I am sure) but I really like yours and my husband deserves a quilt, he is so supportive of my quilting. My quilt will have a "W" (sorry but it has to be a W). Thank you. I'd like to make a Lucky Stars quilt with it. Just love that pattern. I would make a gorgeous quilt with these gorgeous fabrics. Thanks for the giveaway. If I win this lovely fabric, my sister and I would have many discussions about what to make. Finally we would settle on a pattern and get to work on another quilt. I absolutely love your Lucky Stars Quilt and it will my next project - I'm thinking that my letter (G) in one of the stars would be so awesome. Maybe a patwork star??? Hmmmm something to think about. Thanks so much for the chance to win. Color Me Happy just makes me happy...absolutely love it! I would make it into a throw for our couch...wrap myself up in those lovely colors! An awesome giveaway...Have a Happy Day! Yes, I would stare at it and pet it for a while. But then I would make something awesome and colorful with it! I would hoard it for a little while because it looks so pretty in a jelly roll and then I'd make it into a quilt with lots of white in the background to really make the colours pop. Well, I'd make a Lucky Star quilt. Only mine would have the a different letter on it, depending on who I decided to make it for. Very wonderful. I love a scrappy and I love stars which equals making a Lucky Star quilt - - eVentually. In the meantime, it would make friends with the rest of my precuts and stash. 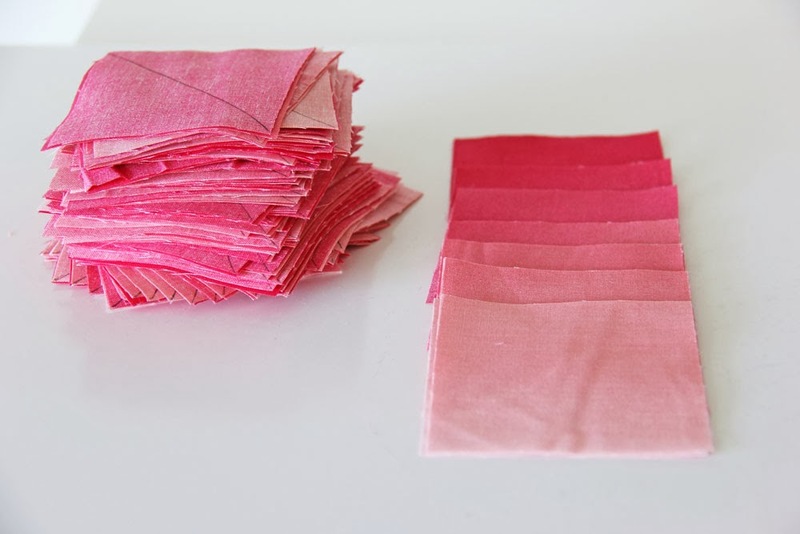 I would oggle it awhile, hoard it, till I have no choice but to put that first cut into it.. Then make some small quilts which is my passion right now. It would be eye candy for me to look at. Then it would become a baby quilt. Love the fabrics. I'd love a chance to use one of your patterns...with a jelly roll or so of course. You're a hoot! I would talk to it telling her how pretty she was and ask her what she would like to be made into. Then we would ponder it for a while then go to town until she was made into a beautiful something. 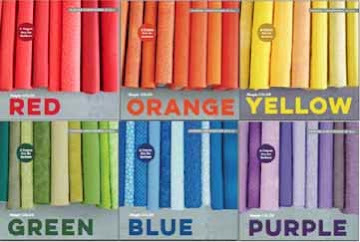 I am making quilts for kids and these happy colors would be perfect. Thank you for the chance to win. If course I would be drooling over it, petting it, and staring!!! Lol! I would love to make my own Lucky Stars quilt to snuggle under! Thanks for the chance to win! We MUST pet the new fabrics for awhile, then when the fabrics stops purring, I'd try that Flower Box pattern. You did great thinking up V words. I would make a quilt with the jelly roll/layer cake because that is what I love to do. Happy Birthday to your noisemaker. Jelly roll, jelly roll, I would want the jelly roll. Love the colors and would love to make a jelly roll quilt. I would make a quilt with the beautiful collection and maybe a tote also. I would stare at it for a while because it is almost too pretty to cut into! Then I would make a quilt for our couch. Thanks for the opportunity to win! I really like the Lucky Star club, that would be a wonderful use of the fabric. Happy birthday to your little noisemaker. I would make a baby quilt for my little boy who is coming in July. LOVE IT!!!! I would definitely make a quilt...and thank you for the coupon to your store...heading there to check it out. Wow, wonderful giveaway! I've got two baby quilts to make and this would be the perfect collection of fabrics! If I were the VERY lucky Vwinner, I think I'd make a baby quilt with that fabric! Hubby's niece just announced she's having her second baby and we are just so excited for her. She's the sweetest little mama. I would day dream about 28 projects I could do... and then make a grandchildren quilt! I think the jelly roll would just have to sit on the shelf with my fabric stash because it is just too pretty to open! I would love to make a lap quilt from the layer cake. The slice is new to me so I would have to do some studying up on it. thanks! Beautiful fabric! Thank you for the opportunity to win such a fabulous giveaway! I would make a quilt using the Moda Spell It letters - and I would probably end up giving it to my lovely daughter…. I love to make things for her! What a generous prize! I love your new fabric line with the green and navy. I would definitely make a quilt - probably from the pattern. Thanks! Like many others I would want to look at the fabric for a while but, as I spent last year making quilts for family gifts, this year I want to make a quilt for my very own self! I love your fabric! I have been tossing around a couple ideas but do not have a set plan yet. I would make your Lucky Stars pattern, love it. Oh how I love the VIBRANT colors of this fabric! I would make the VIVACIOUS lucky star quilt of course! Ha Ha, see I can do this too! Thanks for the chance to win this VERY special giveaway. Make a quilt!!! eventually anyway in the meantime I will lovingly add it to my statsh. How could I not unwrap it, gaze at it, and then begin using it in that fab pattern. What happy colors. I would definitely pet it and stare at it awhile! Then, maybe make a quilt just for me. I love your fabric! I'd have a long petting and staring session with the prize and then, make a quilt! I am making both Quilts of Valor and quilts for a children's home so that is where it would go. 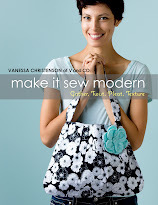 Oh my goodness, Vanessa, your fabrics are amazing! It makes me just want to run over the Nebraska - Iowa state line and party it up with you. Also I fully intend to use your amazing new line in at least two of the five baby quilts I'm working on this spring.. Horray! Such beautiful colors you use! I would stare at the fabric - what a good thing to admit. Then I would finally make a quilt. I would stare at it, pet it, skip around the house with it, then absolutely cut it up and make it into a Lucky Stars Quilt! First instagram . . . Then make some comfy quilts! I think i would leave it out just so i could stare at it. I love having happy colors out around me when i'm sewing. If we don't warm up here in Iowa i think i'm gonna have to start making lots of quilts, and I would start with your fabric. I love the Lucky Stars pattern. I make a lot of quilt for grandchildren and their initial would be a fun quilt. Of course, I would jump up and down for joy if I won anything. Then I would fondle all of the fabric and then make something positively beautiful. Love the colors and thanks for a chance to win. The lucky stars would be a good choice. I would put it up on a pedestal, admire it for a few months, and when I find the perfect quilt pattern I would finally after all the tears (would not want to cut through teary eyes)I would cut it into pieces needed for the quilt. BTW I hate vomiting too! hubby has to deal with that mess for me. Vonderful post. Most likely I will admire it before bravely starting a new quilt. I would make a viberant and happy quilt from it after having petted it apprpriately! I love Color Me Happy! I could make a Lucky Stars quilt with a C in the star! First I stare .... until the fabric tells me what it wants to be. The process is so much fun! I love your happy colored fabrics!!! If I won, I would make a summertime quilt with a thin flannel batting. I've been meaning to make a summer quilt for a long time....just waiting for the perfect fabric to show up at my door!!!! Wow, I would love to win. If I am that lucky, I would certainly use it to make NICU quilts. The fabric would definitely be on display for a while so I can smile every time I walk past it, happiness like that makes the days fly by! Finally the material would dramatically transform into a quilt for me to snuggle under. It's not often I make some for myself but some fabrics you just can't share! Thanks for the giveaway. I would mix that gorgeousness in with my other gorgeous fabric and make a throw quilt just for me! Love the happy colors and I would make a happy quilt! I have a project in mind already! I want to make a quilt for our local rescue squad to sell for a fundraiser! After a good amount of admiring it from afar, I would have a go at some sort of quilt (such big projects are new to me). Ant left overs would be used to make patchwork bags and pouches and if there are still bits left over, I will make hexies with them. Thanks for the giveaway! I would love to win and I'd make a big bed quilt for my little grandson. He is a star. If I was fortunate enough to win this fab prize I would definitely make a nice quilt for my mum for Mother's Day. Love the colours in your quilt. A baby quilt, tote or zipper bag. Just beautiful fabric. I would love to make a baby quilt with these happy colors! I know a little girl who would just LOVE a lucky stars quilt. Your fabric is beautiful. Thanks for the sale and the chance to win. I love the colors you use. So vibrant! I would make a quilt for my daughters new bedroom. The cheerful colors will be perfect! I love your fabric! If I won, I think I would do some EPP with some fabric and probably stash some so I can enjoy staring at it longer. I would make a beautiful bed runner with these yummy fabrics.Thanks! Make a quilt, of course! Can't say what pattern, as the fabric would have to sit around for a while so I can enjoy it. Eventually inspiration will strike! I would put the jelly roll somewhere so I could look at it everyday. It's so pretty! I would make a quilt for my new grandchild on the way. Your fabric is so cheerful and fun, it would be perfect. Pillows! I need new ones & this fabric line will be perfect! Well, AFTER I'm done petting and drooling over it, then I would make some baby quilts for some spring babies. Oh Wow! Such pretty fabrics. I think a new quilt to brighten our Michigan winters is in order! What a fun blog hop this has been! Beautiful AND fun fabric - I hope I win! Ha Ha! I have a shower gift in mind for this wonderful fabric - so happy and cheerful. Happy Birthday to your son - I love birthdays! I love the quilt with the letter in it. Only at our house everyone's name starts with A. But it is a great idea for a baby quilt! I'd use the pattern to make a lovely quilt, the jelly rolls for small projects such placemats, wall hanging, etc., and etc. Plenty of ideas floating around in my head. I am vastly curious about the slice cut! If I won the jelly roll I'd make the lucky star pattern because I really like it. I'm a sucker for sawtooth star quilts. Maybe I'd put an H in one of the stars. I sit and look at the fabric sometimes for weeks and it will tell me what it wants to become and then we create something! I have been sewing something like as long as I can remember and now I am OLD...ha! Well, after just communing with it fir awhile, I would save it to use for a special project with my granddaughter next summer. We always make something together when she comes to visit in the summer. First I would hoard it for a while so that I can admire it. Then I would probably make something useful for my house out of it. I like the idea of placemats for the dining table and maybe some pot holders and other kitchen items. So I have all these baby quilts I need to make (thanks for the sale, I've been wanting some patterns), but honestly, if I won Color Me Happy, I would use it to make me happy. Selfish, but true. I would make a beautiful quilt and donate it to Quilts for Kids to comfort a child who is sick. I'm trying to make some home decor changes and would love to incorporate your beautiful fabrics into quilted runners and maybe some wall hangings. Loved your sense of humor in your blog writing! You must be a fun person to be around. If I were to win, I would make some scrappy looking quilts (like your lucky stars one) and some totes. Your fabrics make me feel like it is getting closer to Spring. I would definitely make your lucky star quilt. It is beautiful! Thanks! 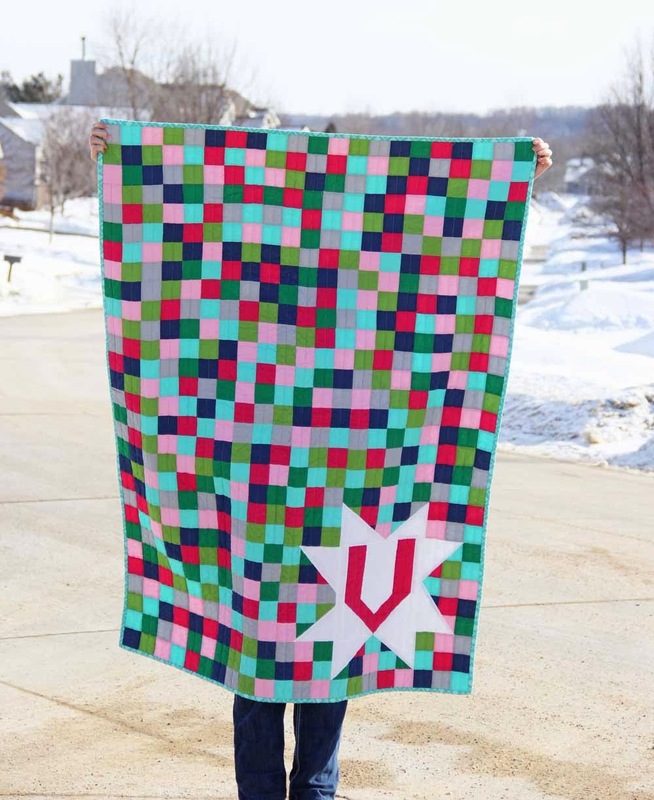 Love your V quilt. If I won, I would make a Lucky Stars quilt for me! I love this line. It is just so happy making!! I already made your Lucky Stars once but want to make another one, it was just so much fun!!! I think I'd mix and match the fabric with others for different projects. I definitely need to make pillows for when I slipcover our sofa and chairs. First of all, when getting new fabric, it is necessary to fondly stroke it, lay it all out, gaze at it, try arranging it in an eye pleasing manner, re-arrange it, and then put it away until a light goes off in my brain to let me know how I'm going to use it! Pet and stare for sure! Drooling, of course as we'll. I'd use it to make your lucky stars quilt. Love it! I would make a baby quilt or two and add the leftovers to my scrap bags which are sorted by colour. My neighbor is going to be a grandmother and I'd love to use that jelly roll in a quilt for the new baby! I think I'll stare at it for a while!! Love your blog!! I would make my cousin a baby quilt with it! I'm sure it would become a quilt but I'm not sure what pattern. Thanks! A color me happy quilt! To win the Color Me Happy would make me Very happy and I would make a Vibrant and Voluptuous quilt to love. I would love to make your Lucky Star quilt with your fabric. Well as per your suggestion, after staring at the fabric and petting it and squealing from the excitement of winning! I'd love to create a beautiful and colorful quilt to take away the winter blues! Thank you for the opportunity to win!! well, dang! 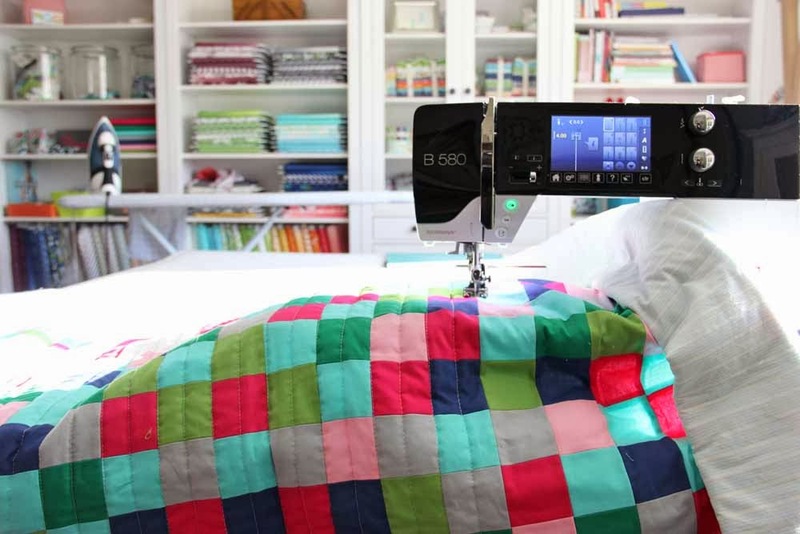 that V quilt with all those awesome little sqs and the intial in a star is pretty hot. might just have to make one of those with your fabrics, should i be so lucky! I have been eyeing color me happy for awhile now and would definitely make something just for me with it! Fabulous post, thank you! Lots of fun. I would definately take the plunge and make a great bag. Normally I fondle my fabric but I like the idea of petting it! And I have a very happy grandgirl who loves to color so a color me happy quilt is perfect! Thanks for the chance to make her even happier. I think I NEED to make your new "Lucky Stars" pattern in this fabric! I've had the Color Me Happy bundle on my wish list for a while so I would definitely pet it and hoard it and stare at it for a while and then eventually, I would make a quilt of some sort with it. Maybe even one using all the letters since my noisemaker is in the process of learning her letters. Thanks for the great giveaway! I love your bright fun colors. First I would take my prize and love it and plan and plan and plan and look through my books and then with the jelly roll I would make the cutest quilt ever. I have to look at the fabric and plan first. I have so many ideas and plans. I love your lucky star quilt pattern. Thanks for this give away. I would make the star quilt and gift it to our son and his fiancee, she said yes last night! I would just look at it and get the feel of the colors and prints before deciding what to do with it. Thank you! Wow, I would mske a quilt for my family room. I just love this line!